RUSH: I want to give a shout out. This does not happen much. Rich Lowry is the editor at National Review and he has a column now that runs at Politico. The column today is called “Rush Was Right.” And as I say, I’m only calling this to your attention because this doesn’t really happen much. He starts out by saying: “There should have been something for everyone in President Barack Obama’s second inaugural address. For liberals, a full-throated call to arms. For conservatives, vindication. Obama settled once and for all the debate over his place on the political spectrum and his political designs. He’s an unabashed liberal determined to shift our politics and our country irrevocably to the left. In other words, Obama’s foes … always had him pegged correctly. I don’t know if they were buffaloed or if they just wanted this guy to be something so badly that they just said that’s who he is. But regardless, whatever the reason, it was right in front of them who he was. It has been for four years and they would never admit it. And while not admitting who Obama really is and always has been, and therefore not acknowledging what Obama’s true intentions are, they have served to muddy the waters, cloud the issues and cast doubt on people who are giving honest interpretations of who Obama is. And so Rich, in his column today at Politico, basically says, “Rush and the guys were right.” And as I say, this never happens. It never happens. I mean, you go to the media and you’ll see a blog here or a website there every day with a rolling feature, with whatever commentator and what he said that day as though it’s some earth shattering unique interpretation or analysis of the day’s events. And they’re always wrong. They’re always mistaken to some degree or another. And part and parcel, if me or my talk show are mentioned, it’s usually in — I don’t want to say they rip it, but it’s not flattering. It’s, “Well, talk radio, these extremists. They’re not serious. They’re just entertainers.” That kind of stuff. That’s why I wanted to call this to your attention. So thanks, Rich. Rich acknowledging from the get-go we’ve been right about who Obama is. And now it can’t be denied because his inaugural address indeed was one of the most partisan and divisive speeches, period, inaugural or otherwise. He basically pointed out he’s got friends and enemies and his job is to take his enemies out, exactly what we’ve been saying, eliminate all opposition. That’s the political objective. He doesn’t come forth with policy ideas. Platitudes, everybody getting a fair shake, everybody getting a fair job, everybody getting a fair outcome. Fair this, fair that, fair and balanced approach, whatever, but he never gets into policy. He can’t be honest about what he wants to do policy-wise. If he had announced in that 2008 campaign — by the way, everything that’s happened in this country for the last four years has been by design. The debt, the growth of government, the expansion of government with Obamacare, all of it’s been by design as part of the plan. He never would have been elected on this agenda. He got elected because he was the opposite, people thought, of who he really is. Moderate, centrist. Post-racial, post-partisan, bring everybody together. If you’re not even in the media or the commentariate, after this speech that he gave and coupled with the real policies, the real actions that he’s taken, if you can’t acknowledge who he is and what his intentions are, you’re not ever going to. And you don’t intend to because you don’t want to. But it’s unmistakable now. And that’s the point Rich is making. It’s unmistakable who Obama is and who he’s always been. I just want to go back to this program, way back, April 17th of 2008. Now, this sound bite, it is of me on this program. It comes from the day after one of Obama’s debates with Hillary, and this was in the midst of Operation Chaos. For those who weren’t here then, let me tell you what was going on. The Republican primary was over. McCain had it sewn up after Charlie Crist endorsed him in Florida. It actually ended in West Virginia when Huckabee threw his voters to McCain and that basically aced Romney out. The Crist endorsement wrapped it up. So the Republican primary was over. And in terms of this audience, no drama on the Republican side. There was nothing to talk about. And there wasn’t all that much excitement for McCain anyway. So I, not wanting to be bored, didn’t want the Democrat primary to end early. And for that to happen Hillary needed to stay viable. Hillary was in debt. She was not winning states in the primaries. The press was totally behind Obama. And so there were some remaining state primaries to go, and I implemented Operation Chaos. 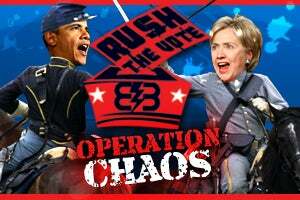 Operation Chaos was designed to keep the Democrat primary going. To prevent Obama from winning it early. To hopefully prevent Obama from winning it period. By propping Hillary up. What was Operation Chaos? Operation Chaos was where I suggested that Republican voters, since the Republican primary was over, in states yet to come in the Democrat primary, go in, change registration to Democrat and go vote for Hillary. It was a tough thing for people to do. They had to hold their nose. The last thing that anybody in this audience ever thought they’d be doing is voting for Hillary Clinton for anything. But the purpose of it was to keep the Democrat primary going, to keep Obama spending money, and to help the woman. Don’t forget, that nomination was Hillary’s. I mentioned this yesterday. Her payoff for sticking with Bill, her payoff for defending Bill, her payoff for not leaving Bill, her payoff for keeping Bill in office, not letting the scandals run him out of town, her payoff was the presidency. It was hers. She was going to be the next Democrat nominee. It was in the cards. It was a 75% sure bet. And then out of nowhere came Obama and the media swooned. They swooned over the possibility of the first African-American president coming from the Civil Rights Era, as they did. It was irresistible. So they abandoned Hillary. Members of Congress, ranking Democrats, some stuck with her, but they abandoned her, went to Obama. And poor Hillary, it was hers and then the Democrat Party powers-that-be yanked it right out from underneath her. For a fairytale. That’s what Bill Clinton described Obama’s candidacy as, a fairytale. (Clinton impression) “That’s all this is, it’s a fairytale.” Talking to Ted Kennedy, “Ted, remember it wasn’t all that long ago that this guy would be fetching our adult beverages. Here he is about to get my wife out of the race.” Then they played the race card on Clinton in South Carolina, and that ticked him off. A lot of people who had been on board with Hillary, abandoned Hillary and went to Obama. And so I rode to the rescue with Operation Chaos, and that involved you. George Clooney made a movie, the Ides of March. I didn’t even know this. I didn’t see the movie until six months after it came out. I had no idea how Operation Chaos really discombobulated the Democrat Party. It really ticked them off. The first 35, 40 minutes of that movie is about Operation Chaos. Because there were Republicans registering as Democrats voting for Hillary and the primary was extended, came down to super delegates, and it worked. Obama had to take that all the way to the summertime. So that’s what was going on at the time of this sound bite. And let me say it again for the record that it was I, El Rushbo, not the Democrat Party, it was I keeping Hillary’s campaign alive, or trying to. It was I trying to defend the honor of the woman. The Democrat Party, they dangled the carrot in front of her, made her think it was hers, and yanked it away for the skinny new black guy who came on the scene. It always happens that women end up getting the shaft in the Democrat Party. Just like we had to defend Carl McCall. We had to fund raise for Carl McCall when the Democrats pulled money away from him in the governors race in New York. And yet they still claim that I am anti-female, this war on women stuff. This program kept her campaign alive. Well, we can’t say that she didn’t have a role in it, but we were there. We did what we could to help her, is the point. So this sound bite, April 17, 2008, this is one day after an Obama/Hillary debate, right in the middle of Operation Chaos. We all knew who Obama was, we knew exactly. But this was the salad days when Obama’s a moderate, a centrist, he’s just wonderful. Blank canvas, whatever you want him to be, he is. He was the Messiah. And yet today, almost five years later, it’s just now dawning on the establishment media that Obama’s not the centrist. Just now dawning on them. Of course I don’t believe that either. I think they’ve known who he is from the get-go. All that other stuff was for public posturing. That’s one of the reasons they were so in the tank for him because he was such a leftist. I want you to hear what I said back on April 17th, 2008. RUSH ARCHIVE: What we learned last night, ladies and gentlemen, well, what America who watched last night learned, because you and I have known this from the get-go, Barack Obama is a fully manufactured candidate. The Drive-By Media invented him. They helped invent him. Therefore, any effort to reveal who he really is, including his associations, past and current, are quickly attacked, and that’s the scope of the criticism today. Let’s face it, his associations are with true, genuine radicals in any number of ways. In addition to his associations that were exposed last night, his ideology was open and bare and anybody could see it. And that was attacked as well. Any effort to expose his liberalism is being attacked today, too. Now, here’s the conclusion. A moderate, as Obama claims he is, a centrist, as Obama claims he is, a uniter, as Obama claims he is, would not be in the same room with the Reverend Jeremiah Wright, would not be in the same room with a former terrorist who blew up the Pentagon, Bill Ayers. A moderate centrist uniter like Barack Obama has promised that he is would not have a wife on the stump making repeatedly offensive statements about the United States of America. A moderate centrist uniter would not have been a Saul Alinsky activist — Obama calls himself a community activist, but it’s much more dire than that. Obama has become, to a lot of people, an idea of what they want him to be. So they project their perceptions on to him, and that’s exactly what he wants. 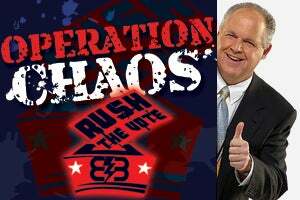 RUSH: But this program was never fooled. We never bought into this silly notion that he’s this harmless moderate, centrist, post-partisan, post-racial, post-whatever. On the cutting edge. Now, after this inaugural address, do you believe the number of people talking about, “My God, this guy really wants to wipe out the Republican Party.” Yep, been saying that for a while. It’s been out there for five years, people just didn’t want to admit it. Even John Boehner is now saying Obama’s goal is to annihilate the Republican Party. What took him so long?